Twitter is the current darling of the Arabic social media world. Along with Facebook more and more tweets are taking place in the Arabic language. So, what can Twitter teach us about Arabic translation? Bebo, MySpace, Facebook and Twitter; as we progress further into the 21st century, social media is taking the globe by storm. Keeping people up to date with personal, countrywide and even worldwide events, Twitter has secured its place in society as a popular favourite. There are now some 554,750,000 active Twitter users and this number is growing, with an average of 135,000 new users signing up every day. Due to Twitter’s growing popularity across the world, the need for a wider range of languages has increased. On the 6th March 2012, Twitter officially announced that it had launched Twitter in four new languages; Arabic, Farsi, Hebrew and Urdu, with the help of 13,000 volunteers across the world who helped with the translation and localisation of Twitter into their native tongues. This has lead to Twitter becoming accessible across the majority of the Middle East. In our recent blog, Why Arabic Translation is Hotter than Chillies, we touched upon social media driving the need for more Arabic translation globally. If we look specifically at Twitter can find some clear reasons why and how it’s becoming a driving force in the region. In early 2013, GlobalWebIndex surveyed over 152,000 internet users in 31 markets and found that two out of the three countries with the highest active Twitter user penetration rates were in the Middle East. In Saudi Arabia, 51% of internet users surveyed were active Twitter users, putting it in first place worldwide. The United Arab Emirates ranked third, with 34% of internet users actively using the social network. Check out this infographic on social media in the Middle East for some more insight. It’s clear to see that Twitter has been adopted in the region and will continue to grow. It’s use within the Arab Spring (Tunisia and Egypt in particular) further cemented its place as a tool for communication. It’s no wonder that Twitter ramped up its advertising in the MENA region early this year! In order to help understand the tweets coming out of the MENA region, Twitter recently unofficially launched a translation tool to convert Arabic tweets into other languages; this occurred in light of the revolutionary events in Egypt. 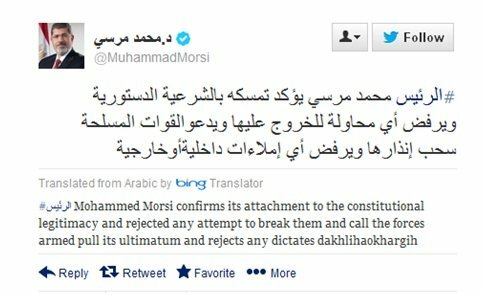 Twitter realised that its users were interested in the developments in the situation but the language translation barrier prevented users from understanding tweets for example from prominent figures in the uprising such as ousted President Mohammed Morsi. So they teamed up with Microsoft Bing to provide a translation service for the tweets so that non-Arabic speakers could gain an insight into the views of the many interested parties. As you can see from the above and the below, while Twitter does teach us that Arabic translation can become more accessible it also teaches us that Arabic translation is at its best when done by a professional translator (if you want to understand it anyway). Although Microsoft Bing provides a good service in translating the tweets of users, it is not 100% accurate; therefore it’s important if using tweets for research/information that a proper Arabic translation service is employed. The concept of Big Data will push analysers now and in the near future to extract accurate information on what Arabic speakers are tweeting, saying, liking, etc. This will itself push those within the translation industry to invent new ways of providing fast translations, accurately and within ever decreasing budgets. So, by way of conclusions, Twitter can teach us many things about Arabic translation, but the two biggest lessons for me are that the language is growing in global importance and that as a result, the translation world needs to find ways to deal with it.